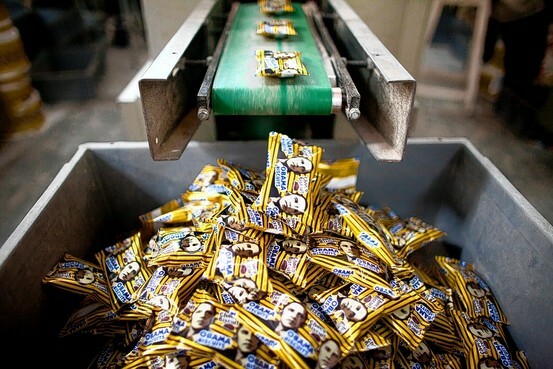 Obama biscuits are wrapped at the United Biscuit factory in Ghana. It seems that Barack Obama is having a stimulus effect on African businesses, entrepreneurs and the results are rather sweet. ACCRA, Ghana—The expansion of a small cookie factory on this city’s outskirts offers a glimpse of how Obamamania in Africa is developing from a fad into a lasting brand for local companies across the continent, even as the U.S. president’s popularity takes a hit at home. Marc Skaf, a portly man of Lebanese-French stock, is the managing director of United Biscuit Ltd., maker of the “Obama biscuit.” Mr. Skaf is overseeing the expansion of the company’s main factory, which during peak production churns out 2.8 million biscuits a day. The Obama biscuit accounts for about 60% of current production. The round cookie stamped with the company’s logo comes in regular, ginger flavor and the latest, ChocObama. Its package bears an image of Mr. Obama, and can be found in small roadside shops across Ghana. Many in Africa consider Mr. Obama, whose father was Kenyan, one of their own. During his visit to Ghana in July 2009, thousands of spectators wearing T-shirts or traditional fabric bearing the president’s image lined the streets to catch a glimpse of his motorcade. That popularity inspired African entrepreneurs. In the months surrounding Mr. Obama’s Ghana visit, hundreds of shops, bars, restaurants and hotels across the continent adopted the Obama name. Dozens of companies put Obama on their products, including bottled water, bubble gum and beer. This summer, Mr. Skaf noticed that a Chinese company had begun exporting Obama crackers to Ghana from China. Mr. Skaf says he has plans to release his own Obama cracker soon. Requests to the White House to comment on the proliferation of Obama products in Africa went unanswered. Obama biscuits are packaged to be sent out to stores. KenAfric Industries Ltd., one of the biggest confectionery makers in Kenya, sells Magic Obama Bubblegum (strawberry and orange flavored). In Zambia you can buy Obama-branded whiskey and brandy. And in several countries, including semi-autonomous Somaliland, you can eat at the Obama Restaurant or the Obama Cafe. The Obama brand may be most developed in Ghana. In Accra, the capital, there is the Obama Hotel, where a portrait of the president hangs in the busy lobby; guests can stay in the Joe Biden room. On the road to the United Biscuit factory, travelers pass roadside artists; one is selling portraits of boxer Mike Tyson, an unidentified woman in a green bikini, and Mr. Obama, depicted in traditional Ghanaian dress. For five months after Mr. Obama’s Ghana visit, the United Biscuit factory produced only Obama biscuits. Demand eventually tapered off, and Obama biscuits now account for just 60% of the factory’s production. Mr. Skaf, who has lived in West Africa for more than 20 years, still faces obstacles to further growth. The price of flour—which makes up more than two-thirds of each biscuit—went up 80% recently, without explanation from flour importers. But Mr. Skaf has big plans for the Obama biscuit. Expansion work on his factory is now almost complete. The company has hired additional staff to supplement the 250 he now employs. In August, he rolled out the newest flavor: ChocObama. He is planning another big push for the biscuits in November, as the holiday season rolls around, including an ad campaign—the company’s first. While an August Gallup poll reported that a majority of Americans, 51%, disapproved of Mr. Obama’s performance as president, in Africa his name continues to be a good way for businesses to attract attention and customers. “Regardless of the status of President Obama’s popularity in the U.S., he continues to be enormously popular in Africa and his name and image are co-opted for many uses,” says David Easterbrook, curator of the Herskovits Library of African Studies at Northwestern University, which has been collecting publications and objects from Africa that use Mr. Obama’s name and image. Despite the challenges, the Obama Biscuits brand is well-established in Ghana. Mr. Skaf introduces himself around town as the “guy who makes Obama biscuits.” His factory manager also has been given a nickname. A good entrepreneur never misses a good business opportunity. Cameroon and the European Union have reached a deal on transparency of exported wood products to the Eurozone market. In the latest step toward fighting illegal logging, the European Union and Cameroon have signed an agreement to ensure shipments of wood products to Europe are licensed. The deal is aimed at helping to preserve the vast rainforest of Africa’s Congo Basin. Under the agreement, all timber products shipped to Europe are required by 2012 to carry licenses showing they have been legally harvested. Cameroon is Africa’s largest exporter of timber products to Europe, and 80 percent of its wood exports head to the European Union. It also is a member of the countries of the Congo Basin, which holds the world’s second-largest tropical forest, after the Amazon. Under the deal, Cameroon will set up a national system to ensure timber production and sales are legal, not only to the European Union, but within domestic and non-European markets as well. The forests of the Congo Basin are considered critical for biodiversity – and also in the fight against global warming. Without restrictions, though, the international environmental group WWF says that by 2015, Cameroon and two other Congo Basin countries – the Central African Republic and Congo Brazzaville – risk having their so-called “old growth forests” completely razed in unprotected areas. Lejeune praises the agreement between the European Union and Cameroon, but says other Congo Basin countries must reach similar agreements and the deals must ensure Africans living in these regions reap some of the benefits. This is a place where good trade policy and good environmental policy intersect. Illegal logging depresses timber prices and damages the environment. This is a unique opportunity for Cameroon to strengthen cooperation with the European Union to better protect it’s’s parks, forests and sensitive habitats from illegal logging. It also helps to keep local communities who rely on forests for their livelihood locked in a cycle of poverty by reducing the income regional governments have to reinvest in their local economy and infrastructure. Forest certification is a system of forest inspection and a means of tracking timber and paper through a ‘chain of custody’ – following the raw material through to the finished product. The certification ensures that consumers know the products have come from forests that are well-managed – meaning they take into account both environmental and social principles and criteria.